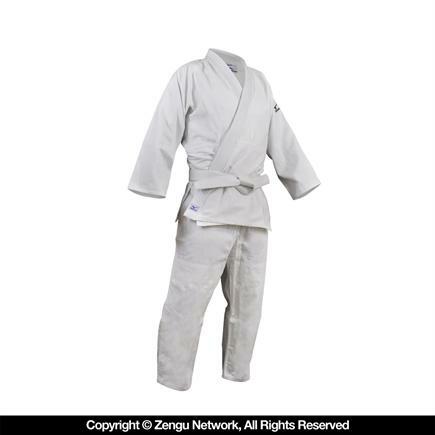 Mizuno Hayato Single Weave Judo Gi & other great retail gear is available. Buy Now! The Hayato is Mizuno's dependable all-purpose Judo Gi, constructed from 100% bleached white cotton materials. The sturdy build and comfortable cut is designed for Judo, but also works for Jiu Jitsu, Aikido, and other grappling-based arts. While many Judo Gis are known for being ultra heavy, this model is engineered to get the job done without weighing you down. Whether you need a Gi for tournament weigh-ins, Summer training sessions, or if you live in a warm, humid area, this is the dogi for you! 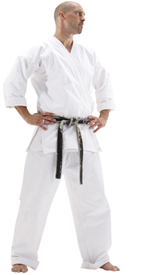 Your Hayato kimono includes a free Mizuno white belt. Q. Will these be restocked soon, or are they being discontinued? Last time I ordered, there were no fives available, and now there are only small sizes. A. Will these be restocked soon, or are they being discontinued? Last time I ordered, there were no fives available, and now there are only small sizes. Comment. Will these be restocked soon, or are they being discontinued? Last time I ordered, there were no fives available, and now there are only small sizes. We do not have a restock date for the 000, however we do have 000 available in a few other brands which you can browse here - http://www.zengu.com/Judo-Gis~2180~cat2113~Size~000~1.html. Q. Is there a reference to determine the proper size to choose from? A. Is there a reference to determine the proper size to choose from? Comment. Is there a reference to determine the proper size to choose from? Hi Fredy. We have a sizing chart link right below the price of the item. Let me know if that helps! I believe the 450 relates to grams jusomu. I bought this same gi 3 months ago. The one I just bought two weeks ago is different from the older version. The older version was made of a tougher/rougher cloth. The new version is made of a softer more comfortable cloth. The Mizuno logo has changed. In summary, this gi is far more comfortable, but will have to see how it matches my previous gi in terms of durability. I also practice karate, so this newer version should be more comfortable to use during karate practice (I got bad irritation on my shoulders & armpits with the previous gi doing tsukis during karate practice). I've had my gi for ten months or more and it is in perfect condition not including the softening of the cotton fabric after washing. This gi will last you forever. If I could tell you what the first thing that would go I would say the knees. Even so, it is a great choice if you're wanting something that is going to last forever. It's good to hear this as durability has to be a top concern for judoka. The wear and tear of the art is definitely high. Fairly comfortable uniform, appears to be durable. So far, so good. I did NOT wash in hot water as some websites recommended for shrinkage. Follow the wash and care directions as it seems to work best. If you're in a hurry, I've found that the pants can be tumble-dried in low heat. I've tumble-dried the top 1/2 way and hang-dry the remainder. Seems to work out ok without additional shrinkage. I'm 6'1'' and 250lb, size 6 fits well, although I wish the top was just a tad larger then it is. What size should I get? I'm 6'0'' and 170 lbs. I am 6'1.5"-6'2", about 170 lbs and practice judo. What size do recommend for me? I don't see size 4 available would a size 3 be to small I'm 5'9 and 150 lbs.? I'm 5'9 150 lbs what size gi should I get would a 3 fit don't see 4 available ? This is my 3rd order for my son and its good quality item. Do you ship to Argentina?? WHat is the extra charge for that? Hi Cristian. Our shipping capabilities and costs change from time to time, but are always updated in our system. I recommend you add your desired items to your cart, and then go through the checkout process. Before having to pay anything, you'll see shipping options as well as estimated cost and delivery dates. You can then decide if you want to order or not. Any size recommendations for someone 5'6" @ 175lbs? I think the size 4 is your safe bet. You should have a little room for shrinking in the wash too. I have been using this Gi for over a month now and it is well made. I weigh 215 and am about 5'10, so a size 5 fits me just right. I'm around 5'11" to 6 feet tall, and about 150-155 pounds. What size would be best for me? Hi Wittgenstein. I think you should go with the size 6, which will allow for some shrinking in the wash but still fit. This is good training Judo Gi. I will order again next time and recommend to others. Cons: Only issue is that they shrink a lot! i only wash with cold water and hang dry. Im 5'8" 160-165 lbs, I bought a size 4 that fit perfect right out the bag but shrunk after a few washes (donated it to a teammate). I then bought a size 5, the top was good but the pants were way too long. After some washing the pants fit perfect but honestly i feel like i could use a 6 in the top. The top fits fine but if it shrunk any more it would be too small. Pros: Very soft and comfortable. Also the cut and construction are very nice. Great price too. Is there any way I can just order the top? Hi Sean. 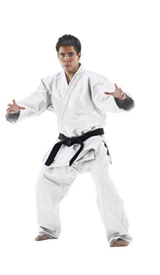 We have a separate top located here - http://www.martialartssupplies.com/kd-elite-judo-jacket.html. We don't have the ability to separate Mizuno at this time. Thanks, i might just get a size 5 and sell the pants. I bought a size 4 but the jacket has shrunk quite a bit even with the cold wash and hang dry. The size 5 jacket would be perfect but the pants are about a foot too long, lol. Sounds good - keep us posted on any way we can help! I'm 5'4/5'5 and currently 175lbs. Although my weight does fluctuate anywhere between 150-175lbs. Would like to know which size gi you would recommend? Thank you! Hello Hardy. The size 4 would accommodate your weight well, although you might find it a little long (hemming would help that). Im 5'8" and 170 lbs should i go with a 3 or a 4? I think the 4 is probably the safe bet, with the ability to shrink it in the wash purpose. I am 5-8 and weigh 265 pounds. What size gi should I order. Hi KWV. The six would give you less excess length than the 7, although I think the 7 would be most comfortable in terms of weight accommodation. I would probably recommend the 7 and be ready to hem the sleeves and legs to take off some length you don't need. HI. My son is 5 years old, begging youdo, 3'9" and 60 pounds. What size do you recommend? Hi Laury. I think the #000 would be your best bet for this particular kind of gi. Which is the grammage of this kimono? Hi Anderson - we don't currently have this item available for purchase. will you be getting more sizes in stock? i see the fuji single weave is very similar, and has more sizes available. but it looks like the fuji has a big patch on the arm from the photo. i would prefer just plain white, so i think this one would be better suited for me. i'M 5'11 and 245lbs. Looking to get my first gi. Should I go with the 5 or 6? Sensei says maybe a half size??? Hi Jose. I think in this instance the 5 is probably your best bet. The help you gave me on the size for my son was great! And the Mizuno Judo Uniform (Single Weave) is excellent Thank You! Hi: My son just started taking Judo. He needs the uniform, They say that they shrink a lot so I need the right size. I did the size chart and I think a 1 would do it but not sure do to it shrinking can you help with the right size before I order it. Thank You Richie! Hight 4"7", Weight 77 Lbs, & Waist is 24 1/2"
I believe the size 0 would be ideal for your son. This gi will definitely shrink if you do hot wash and spin dry. If you go with the 1, do some intentional shrinking. If you go 0, avoid the shrinking (cold wash, hang dry). I am 5'11", 140lb. What size do you recommend for the Mizuno gi? A size 3 might be ideal considering your weight, although if it shrinks you may be a bit short on the sleeves and pant legs. 4 would be a bit baggy I think. I am 5-11 nd 138 pounds, and waist 30-32.Which size judo gi should I get. A size 3 would be nice for you, although the sleeves and pant legs might be a bit short. 4 would be good height-wise but it might be a bit baggy. My son is 4'5". Looking to get Mizuno judo Gi. Pls recommend size. Hi Roman, what's the rough weight and age of your son? Hi, I'm 5''7 and about 180lbs so what would be the best size for me? Hi Carlton. A size 3 would be good for you unless you hold a lot of your weight around the midsection. Then it might be tight, so you would bump up to the 4. I need a Gi for my 12yo son. He's almost 5'11 and 135-140 lbs, and still growing. I'd like something to fit, and something he won't grow out of in 3 months. Suggestions? Hi Kevin. I think a size 4 would be the best choice for him right now. With a 4 though you'll have to be careful not to shrink it in the wash, especially as your son keeps growing. You could try a 5, but I'm a little worried he'd be swimming in it for awhile. I would probably recommend bumping up to a size 5 based on comfort and potential shrinking in the wash.
Somebody who is 5'9" and about 150lb what size should order? I would probably recommend the size 3 for you. Hi, I'm bit on the heftier side...I'm 5'6" and I weigh approx 220lbs. I usually wear a 5.5 karate gi size. I currently have a 5 judo gi, but it's double weave and its tight around the mid-section. What gi size should I get in this single weave mizuno gi? Normally I would recommend a size 4 for you, however if you found the 5 judo gi a bit restrictive in double weave, it might be appropriate to go 5 here in Mizuno. Hi! I'm 4'10", 100 lbs, a size xxs/00 in women's tops and xs/0 in women's bottoms; what size judo gi would be best for me? Thanks! I think the size 1 is going to be an ideal size for you. 2 months as beginners and so far, so good. As mentioned, they do shrink significantly with first wash. We do use the dryer, but after the initial shrinkage, the fit has stabilized. I am 5'3" 185-190lbs with a 34" waist. 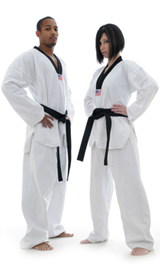 I have 2 gi's with a sleeve to sleeve of 61" and 62" after shrinking and was wondering what size I should get for this gi. The 2 gis I have are Fushida and Toraki. What are the sizes of your existing uniforms? I think your best bet for the Mizuno is going to be the 3. At this time the Mizuno line does not have mix and match sizing. I'm 5'7" and 155 lb. What size should I wear? I think you'd be best served with a size 3. I am 5'11 170' ...lean ripped muscle....lol...What size? A size 4 would be the most comfortable (A size 3 might be a bit too tight). 5'11 190 lbs, but arms around 74" long (6 feet 2 inches). I know Mizuno runs a little big, would this gi fit someone like me with long arms? Thanks. I think a size 4 would work for you. If you're worried about the arm length you could bump up to a size 5, but it might be a little baggy on you. Beginner here, 5'11" 180 lbs and plan on gaining 10 to 15 lbs. What size recommendation would you give me? Thanks. You might fit in a size 3, but I think size 4 would be your best bet. what density is this gi? don't see any information about that. how many gramms per square meter or how many ounces? Sorry usfootman I don't have that info readily available. I know it's a pretty typical density for a single weave. I'm 5'4 and 155lbs what size would be best for me? I believe a size 2 would be ideal for you. Is it possible to get a different size pants from the Gi top. I am 5'3" with a 34" waist and my sleave to sleave measurement on my Gi top is 62". Hi Robert. That is functionality that we are working on but do not have quite yet. I am 5'3" 185 lbs a little broad in the shoulders, what size should I be getting? Hi, I am just wondering if the picture is the same as the gi. Meaning, looking at the picture, it does not have any Mizuno logo on both shoulders. My Mizuno gis have the bird logo on the left shoulder in the bicep area. The Jimmy Pedro model has decoration on the top of the shoulder epaulet. I' m 5'9 and use pants size 34/30 what size will be best. I think a size 3 is going to be your best bet. Hi, I'm about 6'0 and a half inches. about 183. what do you think i should buy? I think you would be comfortable in a size 4. These are one of the best Gi's for te money. Comfortable and great fit! I'm very impressed with the quality for the price. They are not joking that these run a little big initially. I'm 5'10" and my size 4 felt like a tent pre-washing. One hot wash and one full hot dry later and it fits perfectly. Also is very comfortable. I would definitely recommend this Gi. My son is 5'2" and about 100lbs - what size do you think? Size 2? Yes I think the size 2 is a safe play with a little extra space to grow into. Im 5'6" 170lbs. what size should I order? I think the size 3 is the way to go for you, especially with a little shrinking in mind. I'm 5' 7.75" and 145-150 lbs. What size would you suggest? I think you'll want to go with the size 3, keeping in mind you'll be able to shrink it a little in the wash and still be good to go. FIT IS OK. GI IS VERY DURABLE. Hi, I'm about 5'11, ~300lbs with a 44 inch waist. What size would work best? 7? Mizuno does run a little large, but I think you'd be better suited with the Fuji sizes. Hi dino. 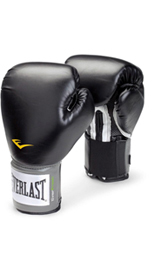 Add the item to your cart and proceed through the first few steps of the checkout process. Before you have to pay for anything you'll see shipping options and predicted arrival times. I''m 5'11" and fluctuate between 215 & 220. I plan to intentionally shrink my gi (warm water and dryer. What size is recommended? Thanks in advance. I think a size 4 would be your best bet, especially with shrinking in mind. Nice judogi... Good price. Fast shipping. Happy! I believe you'll have to go with a size 6 and cuff/hem the pant legs and sleeves. looking for gi that has a rice pattern, not diamond pattern on the skirt. Cant tell from picture if skirt is diamond or rice pattern. Using this gi for judo and BJJ. Problem with diamond pattern is for BJJ it open you up for a lot of gi attacks. This model does have the diamond pattern on the skirt. i'm 5'10" and 180lbs weight, please advice if size 4 is okay or will it shrink too much? If you do cold wash, hang dry you would be fine with the 4. If you'd like to do warm wash, spin dry order the size 5. How much shrinkage is to be expected? I'm looking to purchase my first gi, but I'm in between sizes, so I'm not sure what to get. I'm 6'4'', 195lbs - tall and skinny with long arms. Should I go for the 5.5 or 6? Thank you. I think you may have to go with the 6 and if it's a bit too much play with intentional shrinking. Do the pants have a draw string or elastic? Above size 2 is drawstring. I think a size 5 should be the right size with a little room for shrinking. I'm confused about how the different sizes have overlapping heights. I'm 5'10'' and 150 lbs. What size suits me best? Thanks. Hi Preston. Due to the nature of uniforms, there is some flexibility in regards to what height they fit. You'll notice the jackets come down below the waist and the pants/sleeves have the ability to be cuffed. That provides a broader range for heights that can use it. As for you - I would recommend the size 5, compensating for a little shrinkage in the wash. Size 000 is the smallest. There is a sizing chart link to the left of where you select your size. Hi, Im just starting Judo but not sure if I should get a size 2 or 3. Im 5'2 and 118 lbs. Any help would be nice. Thanks! I recommend the size 2 as these can go a bit large. i am 5'6" and 125lbs, what size should i get? I think a size 3 would probably be best if you avoid shrinking. Conversely you could go 4 and intentionally shrink it. I'm 5'8" and quite bulky... around 250lbs. Recommendation for size? Although the sleeves and pant legs might be a bit long (requiring cuffing or hemming), a size 6 should suit you. I am 5'6 155 pounds. Please advise an appropriate size. I think a size 4 would be best. I am 6.0 tall, 290 lbs, 44 to 46 inch waist. what size should i go with for mizuno? I think a size 6 would be a safe bet. If it's a little big you can do some strategic wash-shrinking. Excellent for the money, and is very comfortable. Karatedepot had this gi to my front door in about 6 days, excellent shipping. I bought a size 4, but i usually wear a size 3. After one trip through the washer on hot, it came out to a perfect fit. The gi top fit very well, and is very soft and breathable. The collar is rather stiff which i prefer, and its very comfortable to wear in warm weather since its a single weave. The gi pants fit spot on, so i suggest buying a size bigger than you normally wear. The gi pants have extra padding that runs nearly 2/3 up the front rather than just at the knees and i really liked this. For those who are just starting out in judo it also comes with a white belt. Over all this is a excellent product for the price and is my favorite gi to wear to both practice and competition. i am starting judo and am not sure what the sizing system is for these gi. i am 6'1 215 pounds with a 46 inch chest and 36 x 36 pant size. what size shoulds i get and what do the sizes transfer to in everyday sizes? I think a size 5 would be the way to go for you. There are no easy comparisons to street cloth sizes, but there is a helpful chart at the bottom of this page. I need for my son 5' tall and weights 95. I think a 2 would be good. hot wash and dry if you need some shrinking. I am 5'4" and weigh 165. My build is barely bigger than a medium frame, but not quite "stocky". I weigh in at under 161 during competition times. Should I get a 3 or 4? I am worried quite a bit about shrinkage. Mizuno does seem to run a little large, so I might go with the 3. In regards to shrinking, you can minimize that with washing cold and hanging dry. im 15, 5' 6", 140lbs. Yea I would probably go 3 in your situation. If it isn't quite right, just hit us up and we'll arrange an exchange. what size would you recommend ? I would go with either 4 or 5. 4 if you like a snugger fit, 5 if you want some extra room. HI, I'M A 6 FT, 190 LBS GUY, WHAT SIZE GI WOULD YOU RECOMMEND? I think a size 5 would be the way to go. I am a 18 year old girl, I am 5'6" and only 115-120lbs. Which size would be best for me? Hey akayana. A size 3 would definitely fit. However since you have a light frame you could also try a size 2 for something a little more form fitting. ...the pants are poorly constructed. Not what I would expect from Mizuno. The pants have torn and I am searching for another pair. A great Gi for the money! I just received this Gi a week ago and I am already impressed! I have to say that this Gi is much higher quality than you would expect for the price. It almost feels like a double weave thickness, and was fairly comfortable even after just 1 washing. If you are thinking of just spending the bare minimum for a student Judo Gi, do yourself a favor and spend the little extra ($20-25) and get yourself an awesome Gi that will likely hold up for years. I ordered this on Thursday and it arrived on Monday afternoon in time for my son's Judo class. It's a great gi and a great value for the ~$40 price. My son, who is 6, has just started his lessons and need to find a good and durable Gi but not much price until I see if he is going to stick with it for a while. Any suggestions? A lot of first timers like the student gi - un-ju-01. It's light, durable, and cost effective. my first time purchasing a gi, and it's a good thing i asked others before hand on what size to get. so, i'm a size 0 in everyday clothes, and would naturally think, size 0 gi but upon learning that it would shrink washing in warm and heated conditions, i got a 3. And of course it came too big, but i had i washed it in cold water and then semi tumble dry in dryer, it shrunk to a perfect fit, no tailoring needed :) And every other wash following would be cold wash and air dry. Mizuno definitely feels better in material than others I've borrowed and tried on. I believe I got a best deal judo gi ever!! Best quality for this affordable price. I will stock up. This gi seems very durable but the material is not as soft as I was expecting. I guess the softness will come from age and wear. I read a bunch of reviews before I ordered it and lots of reviewers on the Internet say Mizuno sizes their stuff on the large side. Now, by first hand experience I can tell you, they do! At least mine was, but mine also shrunk down the first wash (at least) half a size, maybe a little more.